Boil the Water. Boil the water in a large pan on a high heat. The pan should be big enough to allow the water to boil freely and for your gnocchi to rise up to the surface. Tip: Using a lid at this stage will encourage the water to boil faster. Add Salt. Only when you see the water boiling add in the salt. Tip: The rule of thumb is the water should be as salty as the Mediterranean sea! Add Gnocchi. Stir in the gnocchi carefully and continue to boil uncovered until the gnocchi floats to the top which is approximately just 2 minutes. Tip: Make sure the salt is dissolved before adding the gnocchi. Remove the Gnocchi. 10 seconds after the gnocchi has risen remove the little dumplings with a slotted spoon. Dispose of the hot water and return the gnocchi back to pan. Add the sauce, coat well and serve immediately. 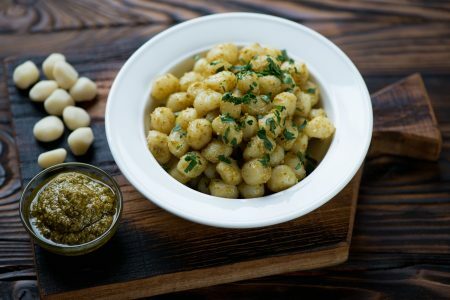 Pan Fried Gnocchi: You can also bake or pan fry gnocchi in olive oil for 8-10 minutes without the need to preboil adding your sauce to the pan after this. 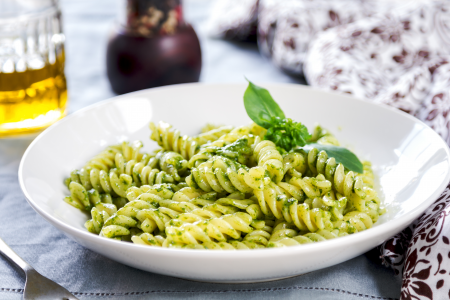 Sauce: The classic Italian way to serve gnocchi is with pesto although these versatile little dumplings can be used with most pasta sauces as an alternative to pasta. Pronunciation: You pronounce gnocchi as “n’yaw-kee”. 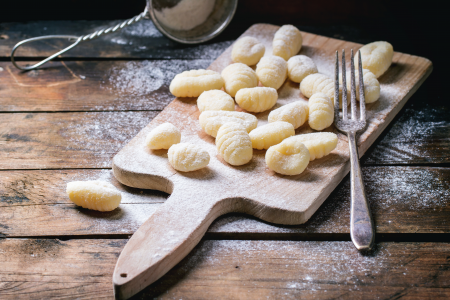 Pasta Gnocchi: Don’t confuse the shell-shaped pasta called gnocchi with these potato dumplings. Confusing we know!